Craig is a Sheridan College business studies graduate with a life-long passion for the arts. As a boy, paint was the medium he chose to express his creativity. As Craig nurtured his talents his attention turned to textile art which ultimately led him to jewellery design. Combining his inherent artistic talents with his desire to learn and perfect new skills, Craig can be described as a self-taught bead master and jewellery designer. 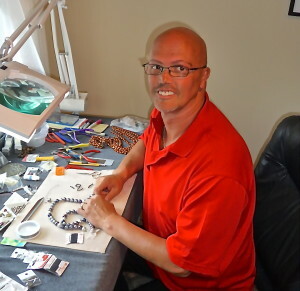 Craig has been designing one-of-a-kind pieces for over 10 years. He designs with great pride when creating wearable art for everyday wear as well as pieces for special occasions. Craig is known for the stunning pieces he has designed for brides and bridal parties. His inspiration can be found in fashions from the art deco era of the 1930s to the post-war flare of the 1950s. Craig designs and creates these magical pieces in his home studio. Pearls are strung by traditional methods; natural stones and supple leathers are painstakingly united with the daintiest of hand-stitches; and crystals are accented with the finest beads and finishes available. Most pieces are built one tiny bead at a time. Whatever the piece, Craig’s favorites are often designed through one-on-one collaboration with clients seeking a signature piece. So, browse this site to see some of the Craig’s work or come to one of the art shows where Craig will be exhibiting his work to see it in person. If you have an idea for your perfect piece, please contact Craig to set up an appointment to see how he can turn your dream into a wearable masterpiece. Craig Ewing designs have been modeled for many photo shoots and even City T.V.’s – CityLine. I have been designing one of a kind pieces since 2005 and stand 100% behind the workmanship of the art I create for you!